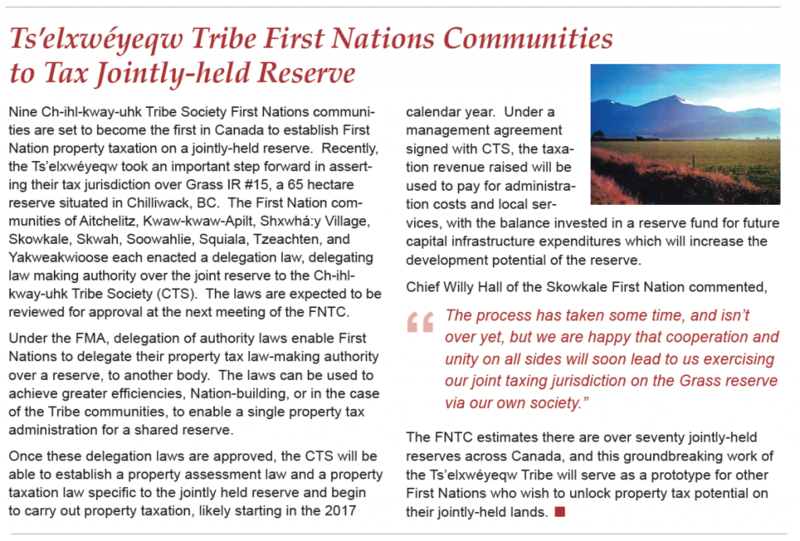 News – Page 2 – Ts’elxwéyeqw Tribe Management Ltd.
Federal Government Approves Kinder Morgan – should we accept an agreement? The federal government has now given approval for Kinder Morgan’s Trans Mountain Expansion Project (TMEP) – soon members of our communities will vote whether or not to support an agreement regarding this project. Because government approval was likely and our conversations with Kinder Morgan were not complete, we needed to have a plan in place. Recognizing this, the Chiefs of the communities signed a conditional Mutual Benefits Agreement (MBA). This does not commit us to supporting the project; it gives us time to decide as a community if we should support the agreement. Over the coming weeks, we will be meeting and discussing the project and agreement in more depth to ensure members can make an informed decision. Members will then vote by March 31, 2017 — details are to come. The communities involved in this decision are: Aitchelitz, Skowkale, Shxwhá:y, Soowahlie, Squiala, Tzeachten, Yakweakwioose, Skwah, and Kwaw Kwaw Apilt. For members of Aitchelitz, Kwaw Kwaw Apilt, Shxwhá:y, Skowkale, Skwah, Soowahlie, Squiala, Tzeachten, and Yakweakwioose. 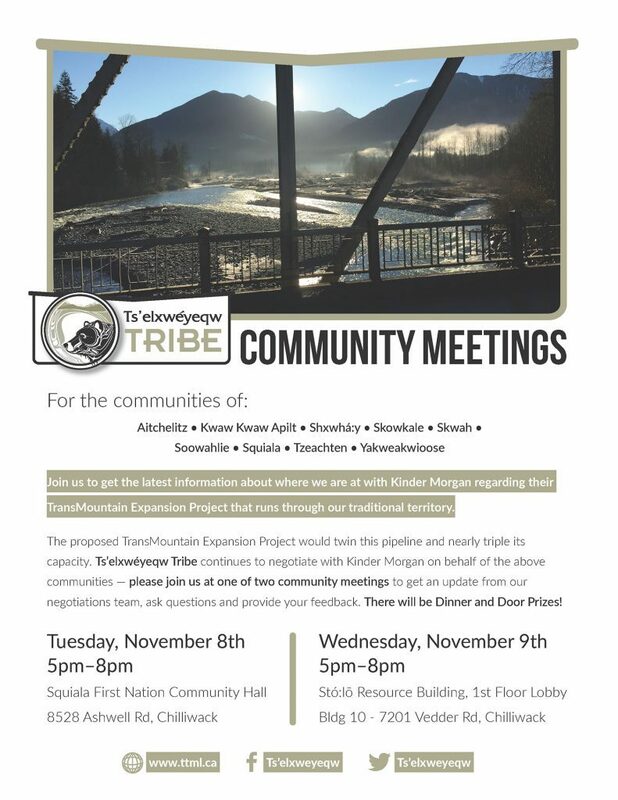 Join us at one of two community meetings to get the latest information about where we are at with Kinder Morgan regarding their TransMountain Expansion Project that runs through our Traditional Territory. There will be Dinner and Door Prizes! Windriver has been engaging with the Ts’elxwéyeqw Tribe and Ts’elxwéyeqw Tribe communities for over 7 years. They have completed a number of environmental assessments including fish and wildlife assessments and a Cultural Heritage Overview Assessment. This Open House will provide an opportunity to ask questions directly and learn more about this project. May 8: Let’s take steps together towards good health. Get moving with BC’s doctors! Doctors and other health care professionals are hosting free walks in communities across the province and walking side-by-side with their patients and the public. Join them on May 8 at Townsend Park in Chilliwack for a walk over lunch on Friday, May 8 from 12 to 1:30 pm! 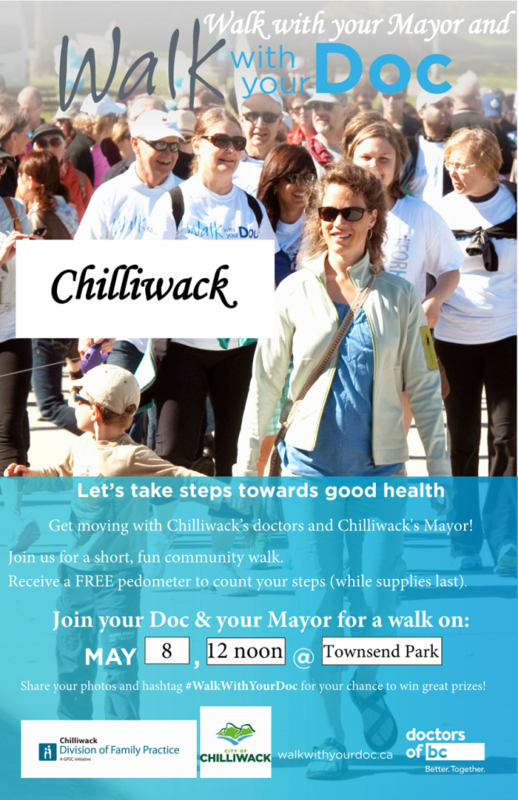 This year Walk with your Doc has teamed up with the City of Chilliwack to also be Walk with your Mayor! Walk With Your Doc is an annual event celebrating daily movement for better health. 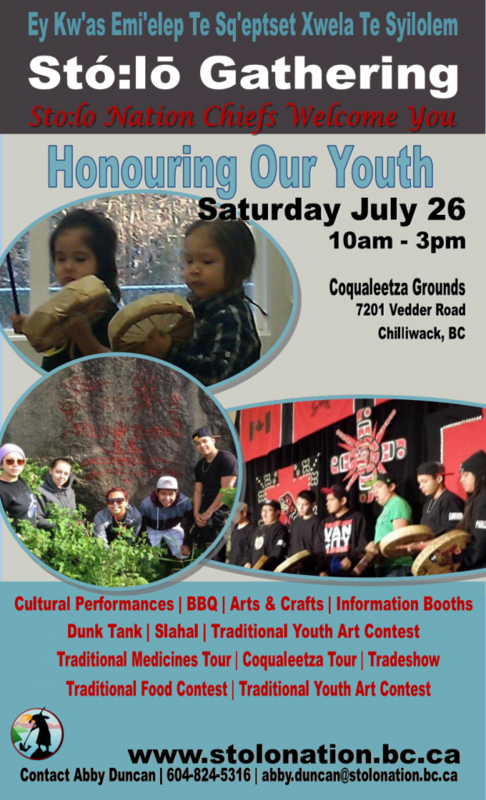 Light refreshments, free pedometers (while supplies last) and lots of fun await!